Tax Day is one of my favorite days of the year. It’s a day when we all come together, agree that taxes are lame, and companies give out free things to ease our pain. Sometimes I have a hard time knowing exactly who is giving out what and at the risk of going to random places and saying “What are you giving away today? ?” (again… yes, I have done this before, embarrassingly enough), I figured I might as well compile a list for you all. Because the 15th fell on the weekend, tax day is technically April 17th (Tuesday) this year. That is when most companies are doing their giveaways. So you have an extra day to compile your game plan! Hardee’s: Free sausage biscuit! Between 7 and 10 am at participating locations on April 17. You have to say the super secret code “Made from scratch” in order to get the deal. Kona Ice: This delicious shaved ice truck has proclaimed April 17 as “Chill Out Day… No taxation without relaxation.” They are giving away free Kona Ice. You can find where your local truck is set up here. Applebee’s: from now until April 30th – celebrate with Dollaritas. Yes, you heard that right $1 margaritas for the next 2 weeks. Boston Market: $10.40 meal – half chicken meal with two sides, cornbread, and a regular drink. Bruegger’s Bagels: Until Tuesday, it is $10.40 for a Big Bagel Bundle (13 bagels and 2 tubs of cream cheese). However, you must sign up for the coupon ahead of time here. Chili’s: $5 Cuervo Blue Margarita or $5 Cherry Blossoms Margaritas at participating locations on Tuesday. Hot Dog on a Stick: On Tuesday, participating locations are giving one free Original Turkey or Veggie Dog; no purchase necessary. 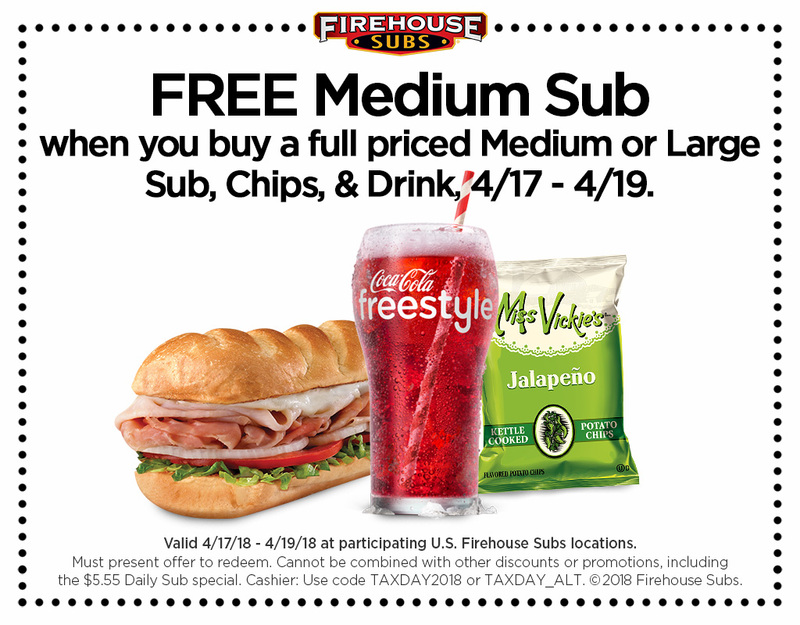 Firehouse Subs: Between Tuesday and Thursday, receive a free medium sub with the purchase of a medium sub, chips and a drink. Must have this coupon. Sonic: Half-priced cheeseburgers all day on Tuesday. Chuck E. Cheese’s: Tuesday through Thursday – Buy one large cheese pizza, get one free. 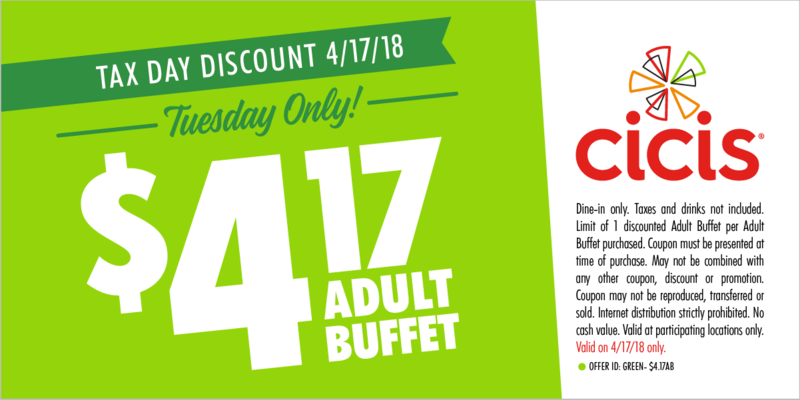 Cici’s: Adult buffets are $4.17 with this coupon. Planet Fitness: Free massage! Between April 14 and April 21, use this coupon to get a free HydroMassage. No membership is required! Office Depot/Office Max: Free shredding of up to 5 pounds of documents until April 23 with this coupon. Staples: Free document shredding until April 21. National Parks: Free admission to any of the country’s National Parks on April 21. These are just the national ones (except maybe hot dog on a stick… haha can’t say I’ve heard of that one), but I would advise to check locally. There may be even more fun things in your area. Feel free to comment on deals you know of in your area.